Lucas van Valckenborch I belonged to a family of painters who were active in the 16th century. He was noted as a portrait and landscape painter and his works combine the Flemish style, with its typically high viewpoints, with a direct observation of nature. For the present panel the artist looked to a work by Pieter Bruegel on the same subject now in the British royal collection, directly copying some motifs from that painting, such as the houses on the right. Van Valckenborch used a path in the centre of the composition to introduce the viewer into the scene and to create a greater sense of spatial depth. The narrative is not set in Bethlehem but rather in a town in the Low Countries, a normal practice in the work of this artist. Among Lucas van Valckenborch’s sources for his landscapes were those of Pieter Bruegel the Elder, which he transformed according to his own style through the use of an elegant, delicate tonality. The artist’s oeuvre primarily consists of landscapes but also includes portraits and allegorical compositions. The first documentary reference to Lucas van Valckenborch I is in Malines where he is registered in the painters’ guild in 1560, followed by references to his presence in Liège and Aachen in 1566, then in Antwerp between 1574 and 1575. Four years later he entered the service of the Archduke Matthias, Governor of the Netherlands, for whom he worked until 1582. Among his works for the Archduke was a large-format series of the months of the year, five of which are now in the Kunsthistorisches Museum in Vienna. The Massacre of the Innocents is an episode from the childhood of Christ that took place just after the Flight into Egypt, and is only recounted in the Gospel of Saint Matthew. According to that text, Herod, angered by the fact that he was mocked by the Magi, ordered all male children aged less than two to be killed in Bethlehem and the surrounding villages in order to ensure that any future King of the Jews would not survive. These infants are considered to be the first Christian martyrs. Lucas van Valckenborch I located the biblical episode in a context in which the figures and setting approximate to genre painting. His Massacre takes place in a Dutch village that symbolizes Bethlehem and whose inhabitants are the victims of infanticide. The painter organised the composition using a high viewpoint with a winding path in the centre that leads the eye into the picture space. On either side Valckenborch located lines of houses, using the spaces in between them to depict horrific scenes of soldiers tearing the children from their mothers’ arms. 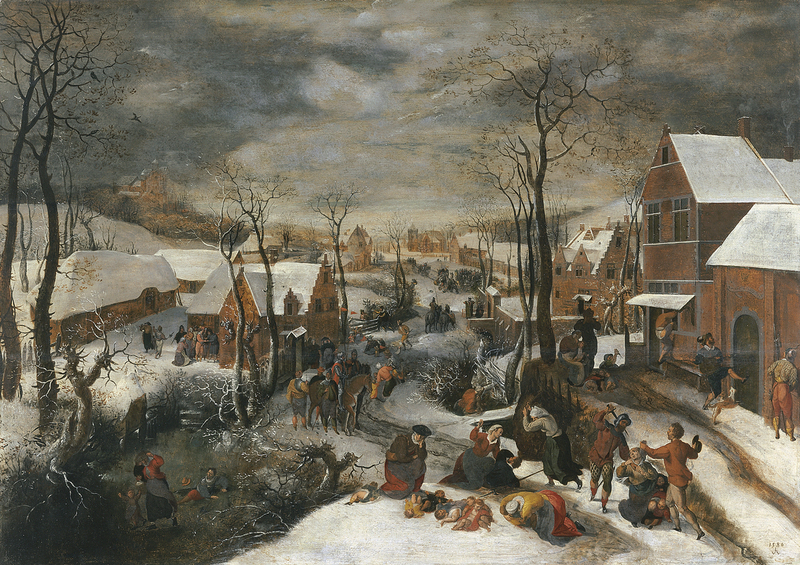 The snowy setting has been related to the work of Pieter Bruegel, who depicted this subject on various occasions, the finest example being in the British Royal Collection. Valckenborch borrowed elements from Bruegel such as the trees and buildings on the right, also reproducing specific figures such as the soldier kicking the door on the right or the one climbing into a house through the window. The Massacre of the Innocents has been considered an original work by Valckenborch since its acquisition in 1956. Ebbinge-Wubben, however, suggested that the figures might be by Gillis Mostaert, while the manner of organising the landscape also recalls that artist’s style. Faggin drew attention to the initials on the panel, which he did not consider to be autograph. Given the generalized tendency among 16th-century Netherlandish artists to execute copies and versions of compositions by other painters and the difficulty of assigning some elements within the present composition, Gaskell attributed this panel to Valckenborch I but retaining an element of doubt.